New York Times bestselling author Heather Gudenkauf has been described as "masterful" and "intelligent" and compared to Lisa Scottoline and Jodi Picoult. Introducing her most compelling heroine yet, she delivers a taut and emotional thriller that proves she's at the top of her class. When a tragic accident leaves nurse Amelia Winn deaf, she spirals into a depression that ultimately causes her to lose everything that matters--her job, her husband, David, and her stepdaughter, Nora. Now, two years later and with the help of her hearing dog, Stitch, she is finally getting back on her feet. But when she discovers the body of a fellow nurse in the dense bush by the river, deep in the woods near her cabin, she is plunged into a disturbing mystery that could shatter the carefully reconstructed pieces of her life all over again. As clues begin to surface, Amelia finds herself swept into an investigation that hits all too close to home. But how much is she willing to risk in order to uncover the truth and bring a killer to justice? 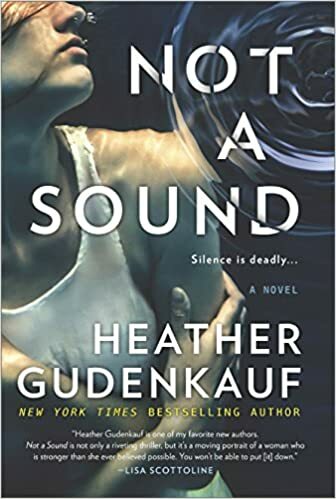 I found myself quickly engaged with Not a Sound by Heather Gudenkauf. The opening was powerful and intriguing and set the scene for this thriller. It also provides the back story by giving us important background on Amelia, the main character, in this. As a result of an accident which severely injured her Amelia, a highly trained nurse at the time, loses her hearing. Additionally alcohol becomes a major factor in her previously happy life. The story is set some two years after the accident and Amelia is beginning to get on top of the life that she now leads. And then she finds a body while out paddling on a local river. Her companion at the time – indeed her main companion now – is Stitch, her support dog. I have to be honest and say I am not really a dog person however Stitch is a good character and it quickly becomes obvious he will be a major part of this story. Written in the first person and present tense this book has an immediacy which enhances the pace for me. From the start it was one of those books where I thought “I’ll just read one more chapter…”. The simple writing was effective and tense. I found Amelia appealing and convincing as a character. The use of her deafness in this tale was very well done. The setting of this book worked well for me in the broadest sense. A combination of the wilds, work, home and those she interacts with was quite vivid to me. This was a tense and well paced read. I’d not read any of this author’s work before however I will certainly keep my eyes open for another of her books based on this one. 4.5/5 for a very good holiday read I think.